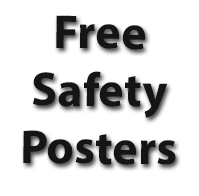 Can't find what you're looking for on this list of free safety posters? We also sell safety posters on a variety of topics. We compiled a list of websites that offer free downloadable workplace safety posters and OSHA related awareness posters. These are royalty-free safety posters, so you can simply download them and edit or print them. Also, we recommend visiting our page featuring a list of free safety videos when you have a moment. For some links I included a few comments about the quality of the posters and the topics covered. Most of the websites listed below offer posters on a variety of OSHA and workplace related safety topics. We also included a few household/personal related safety poster links such as swimming pool safety, etc. I think it's safe to say this this web page is the single biggest source of free safety posters currently available. Please bookmark and share this page with your co-workers and friends. List last updated on 7/31/2014. If you have any you'd like to add e-mail us or comment below. Simply click "any" Category, and "poster" as type then click "Search Publications"
Food Safety Posters - Terrible image quality, graphics not professionally produced, but offers a variety of languages - Berger Food Safety Consulting. Please send me some posters' need them urgently for my health and safety training with my staff. Please if you would send them urgently I would be very thankful. Please I would like some safety posters for my staff training tomorrow morning. If you would be able to send them tonight I would be very grateful ... Thank you.